In a recent interview with Edge, Shigeru Miyamoto, creator of The Legend of Zelda series, said the game he would most like to remake next for the 3DS is the critically acclaimed, 1991 Super Nintendo title The Legend of Zelda: A Link to the Past. "Do you remember Xevious? It's two-layered and I really wanted to create that at the time," he said. "So to see Link To The Past in two layers would be quite attractive for me." This wouldn't be the first time Nintendo remade the game. 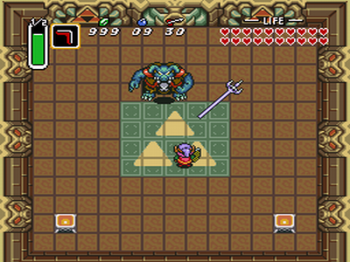 In 2002, the title was ported to the Game Boy Advance with altered music, some updated sprites and even an additional dungeon. This also wouldn't be the first time that interest in remaking the game in 3D has been stated by the series' staff. Back in 2007, Miyamoto's protÃ©gÃ© and current producer of the series Eiji Aonuma told Official Nintendo Magazine that A Link to the Past was his main inspiration when working on Ocarina of Time and that he'd be interested to see it remade in 3D. With two of the most influential forces of the series interested in a remake, an Ocarina of Time remake coming to 3DS next month and the 20th anniversary of A Link to the Past coming up in November, it seems like a complete, 3D remake of the beloved title -- Edge, Nintendo Power and Game Informer, among others, listed the game in the top 10 of their best games of all time lists - could very well happen this time. The question is will the game stick to its 2D roots or follow in the steps of its console sequels?